The kneecap (patella) is a small bone at the front of the knee. The quads muscles attach to the top of the patella. From the bottom of the patella, the patellar tendon passes down and attaches onto the top of the front of the tibia (shin bone). The back surface of the patella is V-shaped, and it sits in a groove at the front of the knee (the trochlear groove of the femur). The patella slides up and down this groove as the knee bends (flexes) and straightens (extends). The surface of the back of the patella and the surface of the front of the knee (the trochlear groove) are each covered in a layer of articular cartilage (smooth, white, shiny tissue that is a few millimetres thick), which makes the joint surfaces low friction, to aid smooth movement. If the patellar isn’t sitting nicely in the middle of the trochlear groove then it is said to have maltracking. Patellar maltracking is pretty much always lateral – i.e. the patellar is sitting too far over to the outer side of the knee. There are many different potential underlying causes for patellar maltracking, and these often occur in combination. With patellar maltracking, if the kneecap is not sitting comfortably in the middle of the trochlear groove then it will rub, and there forces on the articular cartilage surfaces (in the patellofemoral joint) will be increased. This can cause pressure overload and pain, and eventually the articular cartilage can suffer increased wear and tear. For anyone suffering significant pain from potential lateral patellar maltracking, the first step is always to have a proper assessment in order to determine the exact underlying cause(s) of the problem, and this may involve having imaging such as X-ray, MRI and/or ultrasound. Often, initial assessment is by a physiotherapist, and many cases of anterior knee can be improved significantly by appropriate physiotherapy treatments. If patellar maltracking is severe and not treated properly then it can lead to damage to the articular cartilage in the patellofemoral joint, and eventually to patellofemoral arthritis (bare bone on the back of the patella rubbing on bare bone at the front of the knee). If patellar maltracking is bad enough, then it can be corrected surgically. The patella sits at the front of the knee, and with knee flexion and extension it normally runs up and down the middle of a groove in the front of the knee, called the trochlear groove. In many people, the patella is malaligned, and instead of running in the middle of the trochlea groove it runs too far over to the outer (lateral) side. This is called patellar maltracking. With normal patellar maltracking, the forces passing through the patella onto the front of the knee are dissipated evenly. However, with lateral patellar maltracking the joint loading forces will be greater on the lateral side of the patellofemoral joint, which can lead to pressure overload on the articular cartilage in the patellofemoral joint. With time, this leads to increased wear and tear, which can eventually end up with fully blown arthritis. When you are born, and particularly for girls, there is a natural tendency for the hips to be internally rotated (due to excessive femoral anteversion of the femoral neck). Throughout infancy, this excessive internal rotation normally corrects itself, up until the age of about 6 or so. However, in some people the malrotation persists. This is particularly apparent in young girls who sit with their knees turned in and their feet rotated outwards. Some people also have a natural tendency towards being ‘knock kneed’, which is referred to as genu valgum, or a valgus angulatory deformity. Furthermore, many people have increased external rotation of the tibia, so that the tibial tuberosity (the lump of bone at the front of the top of the shin, where the patellar tendon attaches) sits too far laterally. This increases what is called the TTTG (the tibial tuberosity to trochlear groove) distance. In keeping with the above, many people also have flat feet. Flat feet that are flexible (where the medial arch reconstitutes nicely when standing on tip toes) tend not to be a problem. However, very flat feet with poor muscular control can become flat and turned outwards (pronated, or a planovalgus foot). This increases the tendency towards external rotation of the tibia and valgus at the knee. Any or all of these potential factors may contribute to increasing what is called the Q-angle. This is the angle that is made between the line of pull of the quads and the line of pull of the patellar tendon. The bigger the Q-angle, the stronger is the sideways pull on the patella, increasing the tendency for lateral patellar malt racking. The VMO is the inner part of the quads muscle. VMO contraction helps pull the patella inwards, medially. However, the VMO in many people can be quite weak and some people are simply born with a naturally small/deficient VMO. Weakness or deficiency of the VMA causes an imbalance that means that the quads naturally pull the patella laterally when they contract, instead of nicely upwards in the middle of the trochlear groove. The sheets of fibrous soft tissue either side of the patella that help keep it in position are called the medial (inner) and lateral (outer) retinaculae. If a patient suffers even just a single dislocation of the patella then the medial retinaculum will always tear, and this very rarely ever actually heals up within any proper tension in it. Weakness in the medial retinaculum can allow the patella to move laterally, unchecked. The medial patellofemoral ligament (MPFL) is a ligament-like thickening of the medial retinaculum, which passes from the medial side of the medial femoral condyle to the medial edge of the patella, acting like a check-reign and helping prevent lateral patellar migration. Like the medial retinaculum, if the MPFL is torn (from a single patellar dislocation) then it is very unlikely to ever heal up properly. This is an area of contention. Some people believe that a patella can sit too far laterally because of a tight lateral retinaculum. Generally speaking, this is simply not the case. Instead, the lateral retinaculum tends to be tight because the patella has been sitting too far laterally for a long time. This explains why the procedure of isolated lateral release (cutting the lateral retinaculum) on its own (without combining it with some form of surgical patellar realignment procedure) is normally a pointless exercise, as it does not actually address the primary underlying reasons for the patellar maltracking. 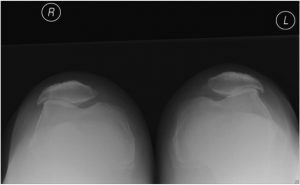 Lateral tracking of the patella can sometimes be due to patellofemoral dysplasia, where the kneecap is L-shaped rather than V-shaped. 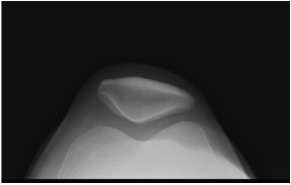 It is critical to examine the patellofemoral morphology in detail (with a patellar skyline view X-ray), as sometimes there can be apparent lateral maltracking (when the kneecap is viewed from the front, clinically), whereas the middle of the groove of an L-shaped patella might actually be sitting quite nicely in the middle of the trochlear groove of the femur.